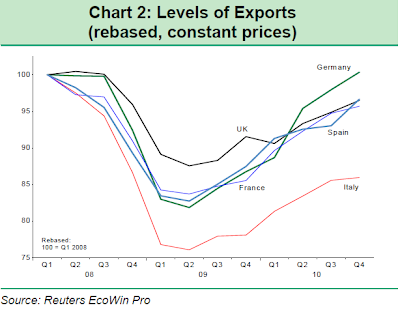 EconoMonitor : Don't Shoot the Messenger » Is Italy, Not Spain, the Real Elephant in the Euro Room? Next BELLS in Hell that Don’t Go Ting-a-Ling-a-LingPrevious Greece: Last Exit To Nowhere? 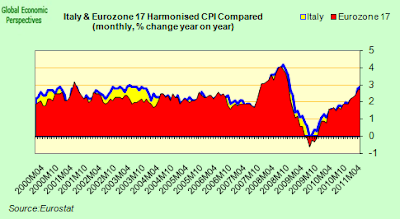 Looking through the latest round of EU GDP data, one thing is becoming increasingly obvious: when it comes to future monetary policy decisions at the ECB, and to exactly how many more interest rate hikes we are going to see, then the performance of the Italian economy is going to be critical. 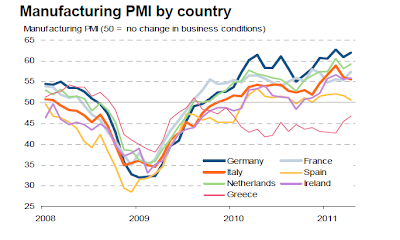 The growth pattern now is clear enough: Germany and France move forward at a lively pace, while the so called “peripheral” economies (Portugal, Ireland, Greece, and Spain) either remain in or continually flirt with recession. They are constrained by the combined burden of their lack of international competitiveness, their over-indebtedness and the contractionary impact of their austerity programmes. In this sense, given its size, Italy is in a key position to tip the balance between core and periphery one way or the other. 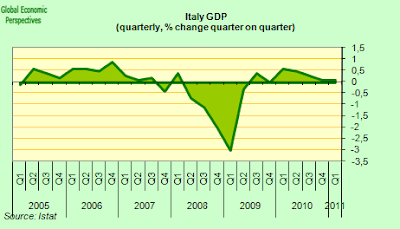 And the fact that, growth in the Italian economy seems once more to be grinding to a halt is not good news in this sense, with the quarterly gowth rate falling back from a quarterly 0.6% in Q2 2010, 0.5% in Q3, 0.1% in Q4 and 0.1% again in Q1 2011. I suppose it shouldn’t really have surprised anyone to find that Italy’s GDP growth rate continued to slip back in the first three months of this year – both in absolute terms and with respect to core Europe – since Italy’s average growth rate during the first decade was only about 0.6% per annum. It shouldn’t have surprised, but I’m sure it did, since the financial markets have only been thinking of how comparatively low the Italian deficit has been since the start of the crisis, rather than worrying their heads off about how a country with such a low growth rate and such a high pending elderly dependency ratio is ever going to pay down the already accumulated debt. Italy’s debt to GDP ratio is currently just short of 120%, while the population median age is 45, so lets just say Italy is Japan without the current account surplus. Now were the quarterly GDP growth rate not to accelerate beyond the 0.1% expansion achieved in the first three months of this year, then even the current IMF forecast for modest 1% GDP growth in 2011 would start looking very optimistic. And if the country now slips back into recession (certainly not excluded) then the under-performance would be much greater. The Italian result contrasts sharply with the strong performance in the main components of core Europe, emphasising yet again that despite the fact that it is managing to stay clear of bond market wrath at the moment, Italy essentially forms part of the low-growth high-public-sector debt economies on Europe’s periphery. Both German and French real GDP growth in Q1 2011 came in much stronger than expected, with the former posting an impressive 1.5% quarterly increase (6% annualised), significantly stronger than the 0.9% expected by the markets, while French GDP increased by 1.0%, in this case with a strong contribution coming from domestic demand which was reflected in a strong increase in imports, imports which in theory should have benefitted Italy. France and Germany are in fact Italy’s main trading partners, accounting between them for about a quarter of Italy’s total exports. 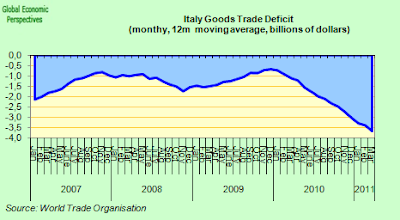 So although we do not have a breakdown of Italian Q1 GDP yet, the above developments point to a stagnating domestic demand only partially compensated by stronger net exports. The most recent results mean that German GDP has now passed its pre-crisis peak, while Italian GDP is still stuck at the level it reached at the end of 2004. 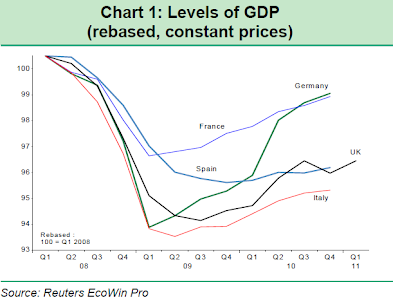 The chart below (which comes from a recent report by PNB Paribas economist Ken Wattret ) shows the path of constant price GDP in the four largest eurozone countries (plus the UK) relative to where they were in Q1 2008. France is in a similar position to Germany, since fourth quarter 2010 GDP was around 1.6% lower than its pre-crisis peak, and it just rose by 1%. The picture in the other countries, however, is very different. In Italy, Spain and the UK, GDP is currently 5.2%, 4.3% and 4.1%, respectively, below the peak levels reached in Q1 2008. So what accounts for the differences? In the German case the strength of the rebound is in-part a by-product the exceptional depth of the recession there. Between March 2007 and March 2008, German GDP collapsed by a cumulative 6.6%. This compares with peak-to-trough GDP declines of around 3.5% and 2%, respectively, during the recessions of the early 1990s and during the first years of the present century. Germany’s strong export dependency, and consequent high sensitivity to fluctuations in global trade, is the key reason why the country goes from strong growth to deep recession and back again (in fact quarterly GDP growth in Q1 2008 was 1.4%, just before the economy fell into recession). This dependency is reflected in the unusually high share of GDP which is accounted for by exports (over 50%), and may well be associated with the unusually high median population age of 45. As can be seen in the chart, the cumulative contractions in GDP in the other large European economies were typically significantly smaller than in Germany, even in a country like the UK which was extremely vulnerable to problems in the financial sector. A similar picture can be found in the US, where problems in housing and the banks formed a central and archetypical feature of the global crisis, even though GDP declined by only a cumulative 4% from peak to trough, two-thirds of the German drop. On the other hand, the Italian case offers an evident exception to the idea that the harder they fall the steeper they rise. 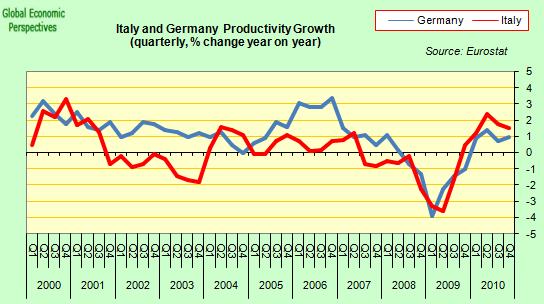 The cumulative decline in Italian GDP from its Q1 2008 peak to the Q2 2009 trough was nearly 7% – making the output loss bigger even than that experienced in Germany. But the rebound has been much less impressive than the German one, with GDP still nearly 5% below the pre-crisis high, and basically still on the level of Q4 2003. In large part, this situation is a result of the weak performance of Italian exports. 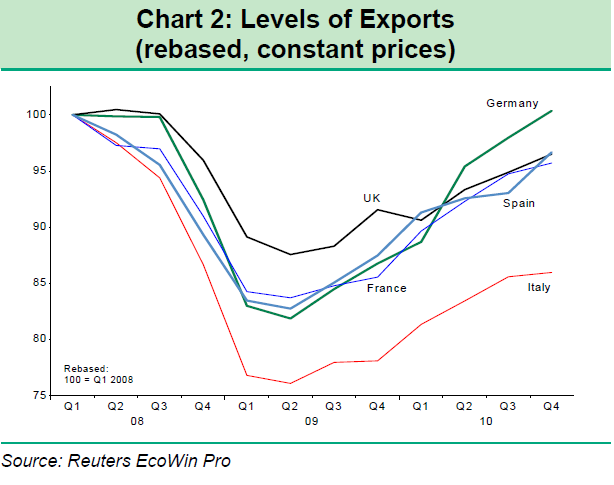 In Germany, exports are now back above their pre-crisis peak, while in Italy exports are still more than 14% under their Q1 2008 high point (See chart). 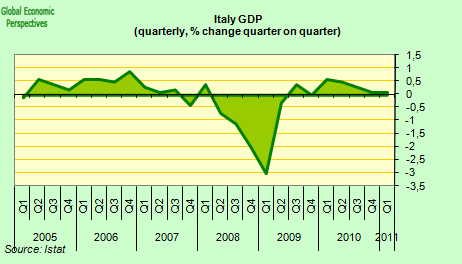 Average quarterly growth in German GDP since the economy bottomed in Q1 2009 has been nearly 1%, while in Italy, it has averaged under 0.3%. 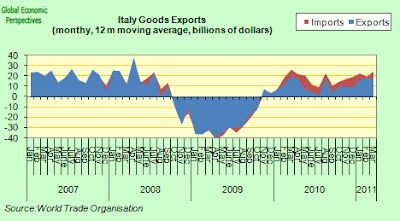 The geographical composition of German and Italian exports is one factor which influences the relative export performance between the two countries. The share of German exports which go to faster growing developing markets like China, has accelerated sharply since outbreak of the crisis, while Italy is still largely dependent on developed – and heavily indebted – economies. 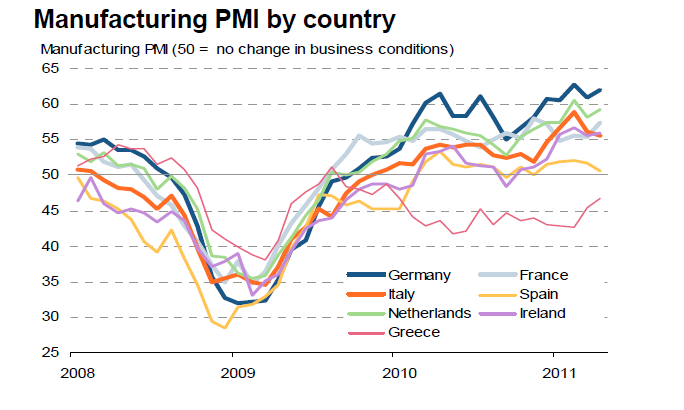 In addition Italy has a major competitiveness problem. 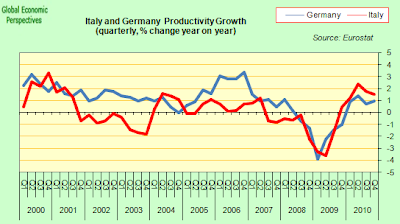 Incredibly, and according to Eurostat data, in the first decade of this century the Italian hourly productivity index only climbed by 0.75%, while the German one climbed by 13.3%. That is to say, German productivity was up an average of 1.3% a year over the decade, while Italian productivity barely moved, rising only 0.07% a year. 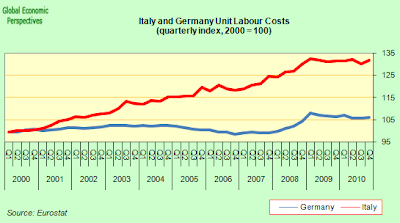 As a result, rising wages meant that Italian unit labour costs surged sharply. So, during the first decade of the Euro the Italians paid themselves more for producing virtually what they were producing at the start of the century. Naturally this is not sustainable. The situation is even more incredible if you take into account the fact that during these years the labour force grew steadily, and the country received several million new migrant workers. 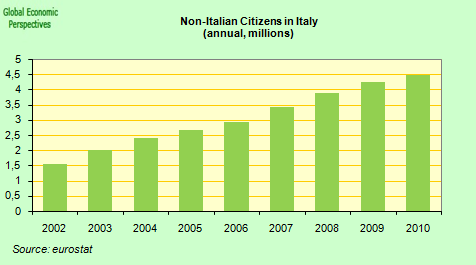 Between 2002 and 2010 the number of non-Italian citizens officially residing in Italy was up by 3 million (or 200%). while employment was up by around 1.5 million. 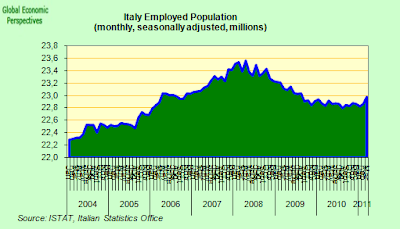 In fact, since Italy left recession the number of those employed has hardly risen, while the percentage of those who are formally unemployed has remained near its crisis highpoint, which has been good for productivity, but not for consumer consumption, the ideal combination would be to see output and employment growing at a healthy pace, with output growing faster than employment. At the present time employment is hardly growing, and the rate of increase in output is slowing notably. That is to say we do not have “lift off”. 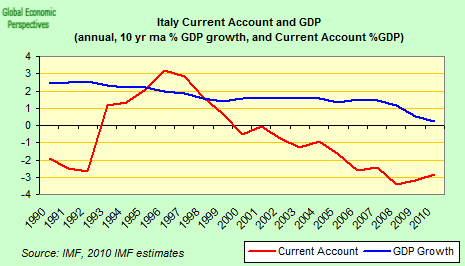 Naturally, this lack of competitiveness is to be seen in Italy’s deteriorating external position, and the drag on growth which this causes is seen clearly in this current account deficit and GDP growth comparison. Exports have been growing rapidly since the middle of last year, but imports have been growing even more rapidly, and hence the goods trade deficit has widened considerably. Growing Your Way Out Of Debt? Aside from the impact on Italian living standards and welfare services, the big issue which arises from Italy’s low and declining long term growth outlook is what this is likely to do for Italian plans to reduce the burden of its outstanding government debt. 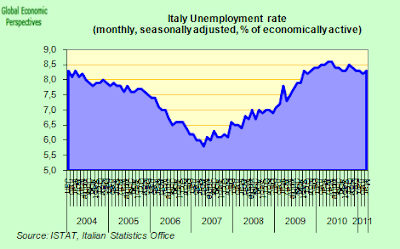 Is, for example, lower than expected growth likely to jeopardise Italy’s achievement of its deficit target for 2011? Well, if there was no increase in spending to compensate for the economic slowdown (and remember, Prime Minister Berlusconi’s party just did very badly in regional and local elections) then the knock-on effect on the deficit would probably be small and probably not a large enough change to seriously call into question the Italian government’s commitment to its fiscal policy targets given that the 4.6% deficit achieved in 2010 was 40bps below target and that the Government is aiming for a 2.7% deficit by 2012. But Italy’s problem has not been its high deficit level during the crisis, it is the high debt level the Italian government has accumulated over the years, and the continuing under-performance in growth terms means the government may well struggle to turn the situation round, and that some sort of restructuring (soft or hard) at some point may well be needed. Let’s take a look at why. According to OECD data, while Italy ran cyclically adjusted primary deficits (that is deficits before including interest payments) every year between 1970 and 1991, the country has run cyclically adjusted primary surplus every year since 1992 – even during the depths of the recent crisis. Thus Italy’s cyclically adjusted primary balance (as a % of GDP) has been in better shape than the balance of many of the largest developed economies. Notwithstanding this, the weight of debt as a % of GDP has continued to rise. 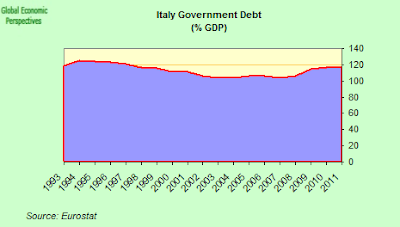 So, while Eurostat recently confirmed that the Italian 2010 public deficit was 4.6% of GDP, and 40 basis points below the Government target,the debt to GDP ratio was revised up to 119% (in this case higher than the Government’s target number). What makes the difference is the impact of history and the weight of the accumulated debt, since interest needs to be paid on the debt. Now Italy has set itself the objective of reducing the overall deficit below 3% of GDP by 2012. Indeed, the government’s 2011 Economics and Finance Document (EFD) sets itself extremely ambitious targets for fiscal policy. The objective is to achieve a broadly balanced budget by 2014 through the achievement of a deficit/GDP ratio of 3.9% in 2012, 2.7% in 2013, 1.5% in 2013 and a 0.2% in 2014 and (as the document says) “so on systematically increasing the primary surplus to continue on the path to reduce the public debt”. The aim is to maintain the fiscal balance within a range which is compatible with reducing the debt. But just how realistic is this objective? Well, to make a comparison, back in March, ECOFIN proposed quite far-reaching changes to the current Stability and Growth Pact (SGP). In particular the Finance Ministers proposals included the incorporation of a principle of extra fiscal effort for heavily indebted countries – a principle which has become widely known as the “debt-brake” condition. According to the new proposal excess debt, i.e. public debt above 60% of GDP, should be reduced by 1/20th per annum. This new debt-brake condition has important implications for heavily indebted countries who have so far escaped the full force of market attention, such as Belgium and Italy, since these two have to deal with debt to GDP ratios hovering around 100% and 120% respectively. What is surprising about the fiscal path proposed by the Italian government in its EFD is that it appears even tougher than that implied by the new EU debt-brake condition. Of course, assuming Italy meets its fiscal deficit objectives – which naturally imply no counter-cyclical stabiliser deficits during recessions (is this really realistic??) – the key variable to watch for the debt/GDP ratio is nominal GDP. Now Italy managed to achieve nominal GDP growth of around 4% a year in the decade before the crisis, and a rough and ready calculation suggests that with nominal GDP growth of around 4% debt to GDP would be down under 100% following the Econfin criteria, and under 95% following the Italian government’s own EFT. “For countries attempting to address these twin imbalances within a currency union, there is a ‘Catch 22’ situation: competitiveness can only be regained via real exchange rate adjustment (i.e., by running lower inflation than the Euro-zone average). However, in order to boost public sector finances, economies need stronger nominal GDP growth and, thus, relatively low inflation (or deflation) has the effect of exacerbating the public-sector deficit problem. In other words, it is difficult to address one imbalance without exacerbating the other, and vice versa”. If we simply take this years outlook as an example. Italy, as we have seen, is unlikely to achieve more than 1% real GDP growth (and this a year of strong global expansion), but the country might just get nominal GDP growth of 4%, since inflation is currently running near to 3%. At the same time Germany may have GDP growth nearer 4%, and inflation around 1% lower than Italy. These kind of inflation differentials just don’t make sense, when you consider that it is Germany that is booming, and Italy that is near to falling back into recession. 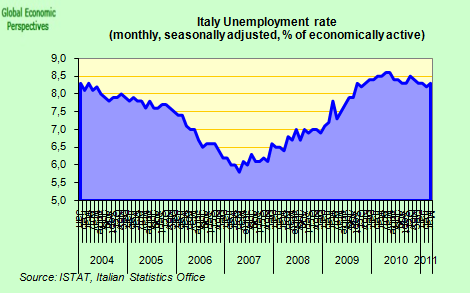 Such differences are symptoms of deep economic rigidities in Italy. Since he wrote this in 2006, and growth over the decade was something like an average of 0.6% I would say that his expectation wasn’t a bad guess. 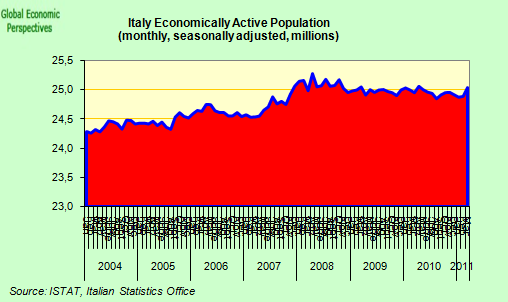 What puzzles me at all the people who now “guess” that Italy will be able to put in enough a much higher growth rate over the next decade. The IMF are expecting real growth of about 1.3% between 2012 and 2015, and the EU forecasts are not substantially different. As average growth rates this seem very optimistic to me, especially given the recent performance. The problem is, like many on Europe’s periphery, after a decade of Euro membership the Italian economy is seriously distorted, and badly in need of devaluation, but of course, as elsewhere there is no currency left to devalue, hence some sort of debt restructuring to reduce the burden of interest payments may be the only alternative while we await the jury’s verdict as to whether all these structural reforms work or not. Many, of course, will say that Italy is a lot richer than it seems, since so much economic activity takes places in the informal sector. But this is entirely beside the point, since the informal sector by definition does not pay taxes, and I will believe a promise to reduce the importance of the informal sector when I see the results. 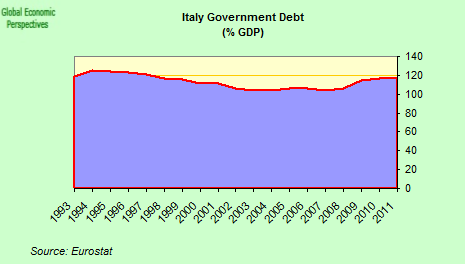 In the meantime Italy is, at best, a country which is much richer than it seems where government finances are in danger of spinning off into an unsustainable debt spiral.